Within the backdrop of an exciting confrontation between their comfortable city and some invaders coming in from outer space (who are wrecking everything faster than it can be rebuilt in a city of Master Builders), Emmet and Lucy are significantly changed for the better. 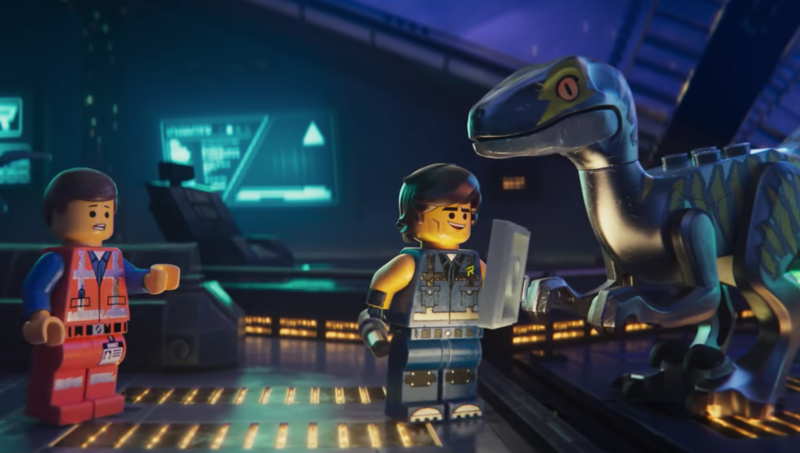 Emmet is both helped and hindered by making the acquaintance of Rex Dangervest (also Pratt, signifying polar opposite traits in the same person), who is brash and confident and easily counteracts Emmet’s diffidence. When Lucy gets kidnapped, Emmet enlists the help of Rex in getting her back. Their struggles increase insight for Emmet and Lucy; however, Rex’s issues are more complex. At any rate, there are exciting scenes showing colorful vignettes of the invaders led by Queen Wa’Nabi (Haddish) and the heroic efforts of the Bricksburg trio (Emmet, Rex, and Lucy) to protect themselves. The invaders are clever in “brainwashing” others to join their ranks, including Batman (Arnett) who is seduced into wedding the queen, despite his fiercely avowed bat-chlerhood. [The manipulative clichéd means by which Queen Wa’Nabi seduces him are some of the scenes I hope do pass over the heads of children.] But there is a quick twist toward the end of the story that seems to discount the charge of brainwashing.